Today I’m showing you how to freeze bananas. 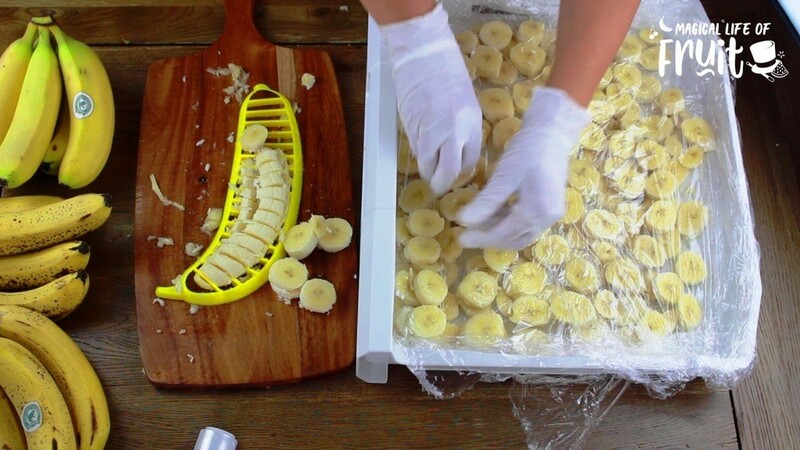 There are 3 methods you can choose from when it comes to freezing bananas. And I’m going to share the pros and cons of each method. Freezing your bananas helps you avoid wasting your bananas if you have too many unripe bananas. It also gives you instant access to frozen bananas which will allow you to make thick shakes and banana ice cream in a flash. If you’ve never frozen bananas, you’re really missing out. For some reason freezing a banana totally changes the way it tastes. Even if you don’t like bananas, I think you’ll love the taste of frozen bananas, because it is less banana and more creamy for some reason. When you’ve frozen your bananas you’ll be able to make a number of tasty treats such as the popular banana ice cream, also known as ‘nice cream’ because well it is pretty nice. 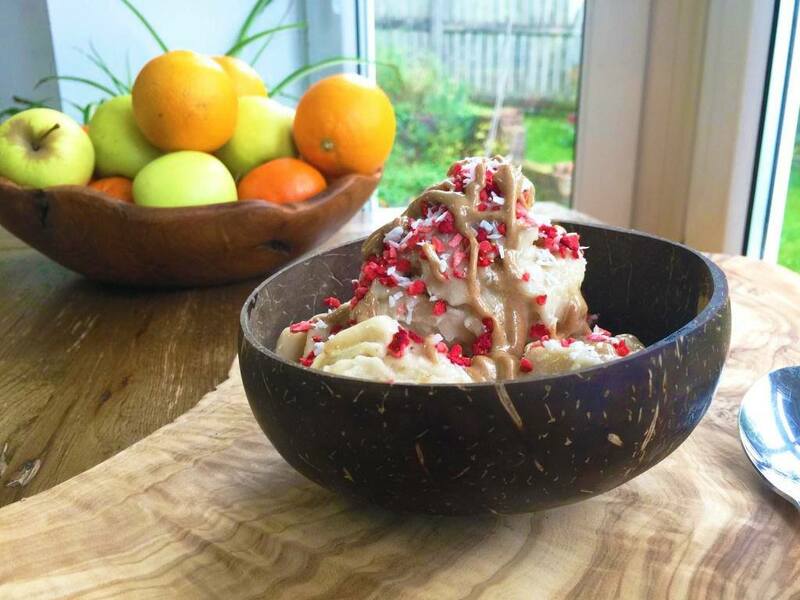 You’ll actually be struggling to tell the difference between normal ice cream and banana ice cream so it’s well worth freezing your bananas just for that reason alone. Below I give you my quick tutorial on how to freeze your bananas and there are 3 different methods to suit your own needs. This is my favourite method. All you do is slice your bananas and arrange them on a layer of plastic wrap or a non stick baking mat inside your freezer tray. Make sure the slices aren’t touching each other while they are freezing. 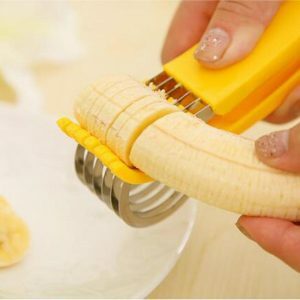 I like to use my Banana Cutter to slice the bananas as it makes this task so much faster and I get uniformly perfect banana slices. 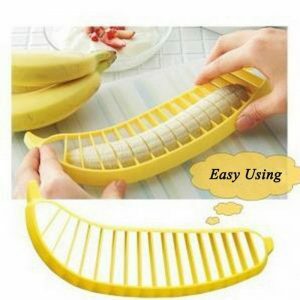 All you do is place the banana under the banana slicer and push down. The whole banana is sliced at once which saves you a lot of time when you are doing a big batch of bananas like this. I like to prep a big batch of bananas at once as it lasts for months and it means I always have frozen bananas on hand when I need them. One of my freezer drawers is dedicated solely to frozen bananas. Having thinner slices like this also makes it much easier to add the banana slices to recipes. It is much easier to blend or process a thinner slice of frozen banana than it is to blend a thick chunk or even a whole banana. Even the high speed blenders would struggle a bit with thicker chunks of bananas. 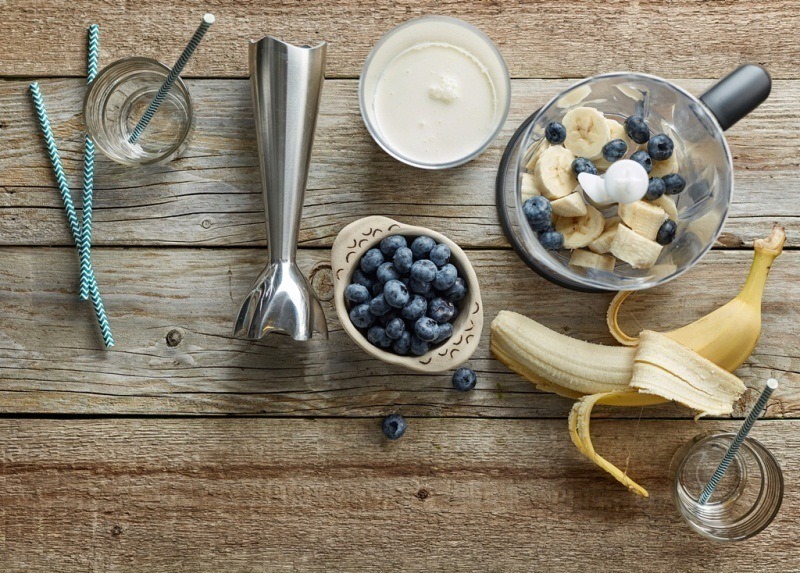 Although it does take longer to slice your bananas, it makes things so much faster and easier to add frozen banana slices to your blender when it’s time to make the recipe. ll you do is leave your frozen banana in the drawer overnight or for a whole day, and the next day you can just add your frozen banana slices to a bag. Once they are frozen it doesn’t matter if the slices touch each other. 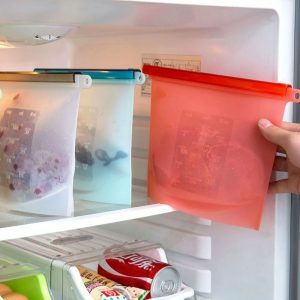 If you want to avoid waste you can use reusable non stick oven mats in your freezer, and you can store the frozen banana in reusable freezer bags. I’ve ordered myself some reusable freezer bags too and you can also buy them in the store by clicking here. 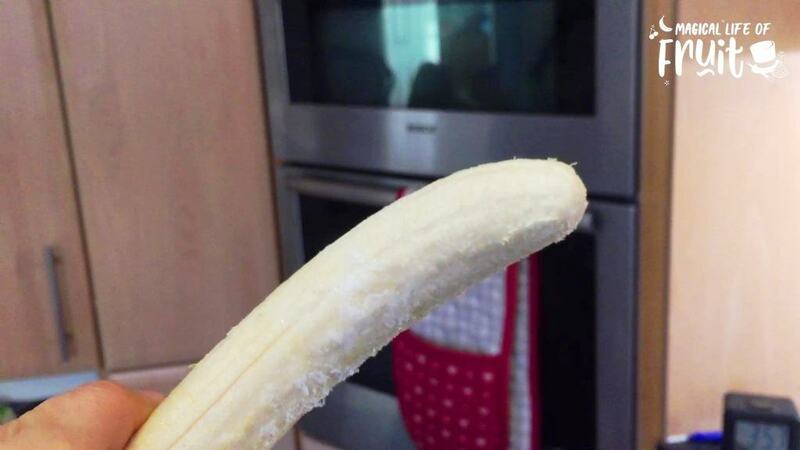 If you don’t have time to slice all your bananas, a good alternative is to peel the banana and freeze it whole. 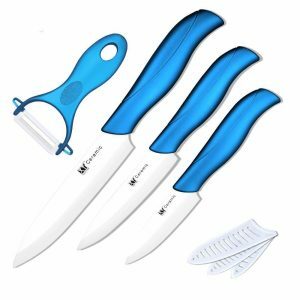 The advantages of this method is that it saves you time slicing the bananas, and you don’t have the problem of removing the peel from the banana. 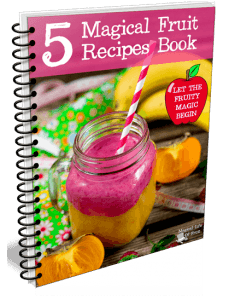 The disadvantages are that you won’t be able to use the banana straight away in your recipe. You’ll have to wait for the banana to thaw for at least 5 minutes and it is difficult to speed up this process. You can also try breaking the frozen banana with your hands, but this is pretty cold and you’ll probably not get very small chunks when you try this which won’t help too much. I don’t often use this method because I tend to take my bananas out of the freezer, walk away and forget about them, and come back to brown gloopy bananas that have gone off and have been wasted. But perhaps you are bit more focused about your banana defrosting than I am. After your bananas are frozen you can also store these together in a freezer bag. And if you’re really in a rush you can freeze bananas in their skins, even placing the whole bunch of bananas with the skin left in your freezer. The advantage of this method is purely a time saver. I often do this if I’m going away for a week. I always have loads of ripe bananas and I just place them all in the freezer at the last minute. So what about the downsides? Well it all comes down to peeling these frozen bananas. How to peel a frozen banana? This is a bit trickier because banana peels are stuck tight on when they come straight out of the freezer. The first way is to wait 5 minutes until your banana has thawed a little bit. Slice off the ends, slice the banana in half lengthways and peel using your hands. The second way is to wait about 2 hours until your banana has almost completely thawed. Your banana will be a soggy mess by this stage so it’s tricky to peel as it’s so slippy. So simply use scissors to cut off the end of the banana and push the banana out in one go. Lastly, if you can’t wait even 5 minutes, you can run your frozen banana under hot water to thaw it quickly. What I do most often is to just place a bunch of bananas in a washing up bowl of hot water for a few minutes and then I add them to my smoothie. When I’m making ice cream I tend to use frozen sliced bananas as I just find it much easier. When I set bananas to thaw I tend to over thaw them making the bananas soft and warm which makes it impossible to make ice cream when your bananas aren’t frozen anymore. So that concludes our 3 ways to freeze a banana. I practice a combination of having both frozen slices for ice cream and freezing bunches of unpeeled bananas for making smoothies with when I have too many ripe bananas. Now I have some frequently asked questions about freezing bananas. How Long Does It Take To Freeze Bananas? It takes 1-2 hours for your bananas to freeze enough to make smoothies or ice cream out of them, but if you’re not short on time, it’s better to freeze them overnight to make sure they are at their hardest. How Long Can You Freeze Bananas? Bananas will keep in the freezer for at least 3 months. And I have been known to keep frozen bananas for about a year, and they’ve still tasted good to me. How To Freeze Bananas Without Them Turning Brown? 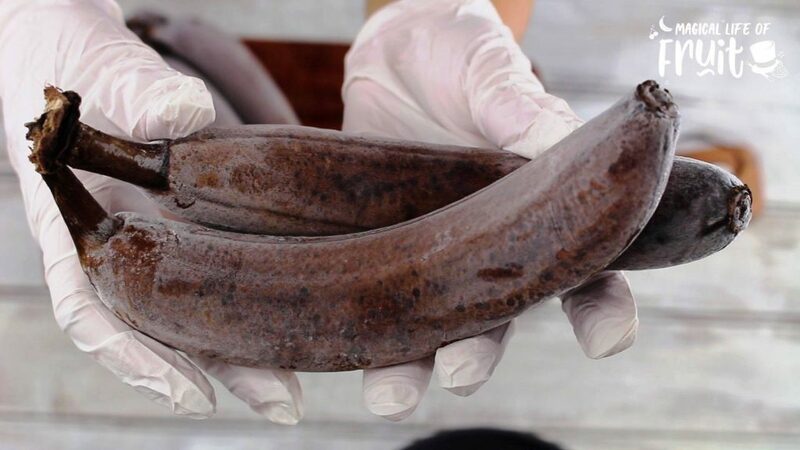 Bananas turn brown when they are exposed to air for too long. So the secret is to work as quickly as you can, making sure you don’t leave unpeeled bananas out of the freezer for longer than needed. Another thing you can do is once the bananas are inside the freezer, you can store them in an airtight bag which will keep the oxygen away from the banana even while in the freezer. I find that when I freeze whole bananas, they are less likely to go brown. A trick to freezing peeled whole bananas, is to peel one banana at a time, and place that one in the freezer, close the freezer and move on to peeling the next bananas. That limits the air exposure and I never have brown bananas when I do this. How To Freeze Bananas For Smoothies? I prefer to freeze banana slices so I can add them completely frozen to my blender and not have to wait for them to defrost first. 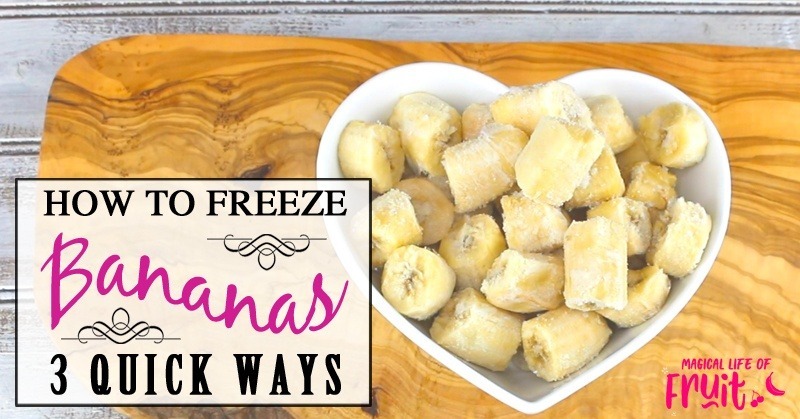 There are so many things you can do with frozen or fresh bananas. 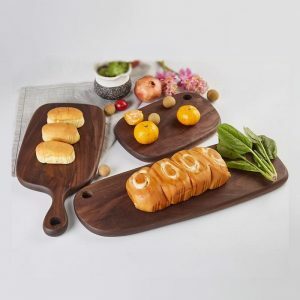 You can make banana bread, smoothies, make nice cream (banana ice cream), chocolate puddings, banana pancakes, muffins, cookies, energy balls or banana oatmeal. Today we’re giving away this Super Strawberry Huller. This tool can be used to remove strawberry hulls in seconds. Save time and keep more of your fruit Just press the button, and push into the strawberry and release. Your hull is removed easily and quickly. It takes seconds to hull a whole batch of strawberries with this tool. I use mine every single day. If you enjoyed this article, How To Freeze Bananas, please let me know your thoughts in the comments.